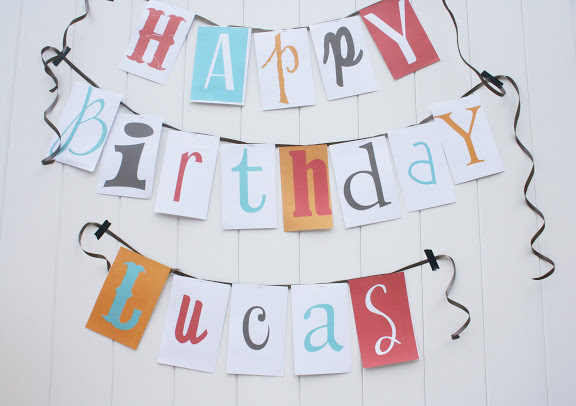 After having to postpone the party because of rain, we finally celebrated Lucas’s third birthday over the weekend. Even then I thought we were going to get more rain, but it all ended up being perfect. 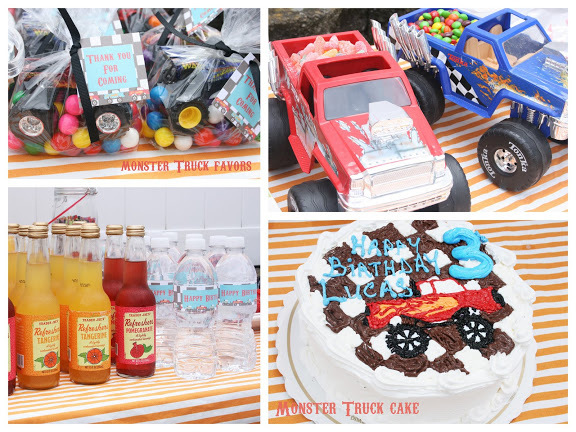 Lucas got his request–a monster truck theme party. Let me tell you–there’s not much out there for this theme, so it was a little tricky coming up with ideas. I incorporated his invitation colors in the party decorations. Pulled out all his monster trucks and used them for centerpieces/balloon weights. The party favors were, what else but monster trucks and Lucas’s favor candy–gumballs. I made the banner on my computer and home printer. Used different fonts with different colors for each letter and printed two letters per one 8.5×11 sheet. Cut and then stapled on ribbon. It took me about 15 minutes to make. Super easy. 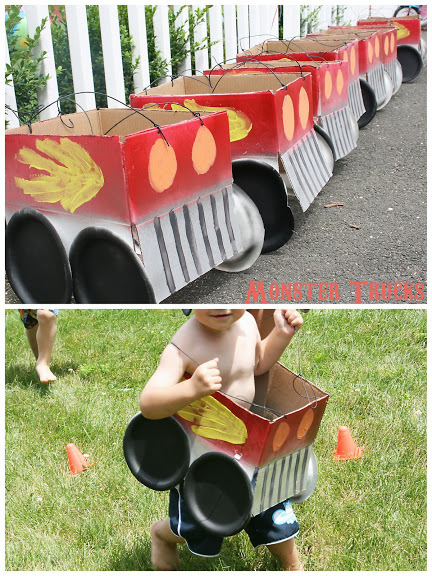 Made monster truck costumes for each of the children, so they could have a “monster truck rally”. Bought small shipping boxes–cut the flaps off one side. Spray painted top part red, bottom metallic. Spray painted small white plates black for the tires (although you could just buy black plates). And then painted on truck decal and headlights. Punch holes and strung black twine. The back of each “truck” had a “license plate” with the children’s name on it that I made in Word. 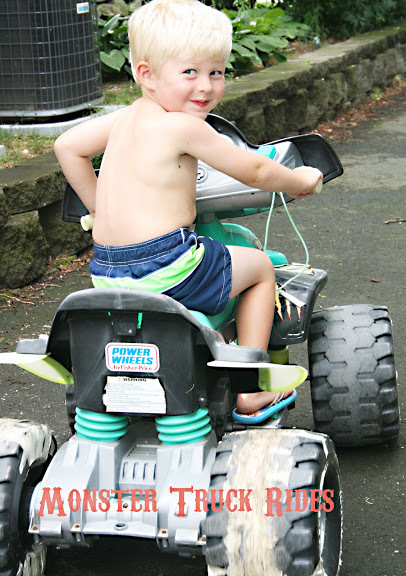 We were lucky enough to have a ride-on monster truck, so the children had fun rallying it down our driveway. Why not add some water into the mix? It’s summer. The backyard was the “monster pit” with lots of obstacles. He’s a very happy boy. He already asked me if he could have a dump truck party next year. Oh, his love for the four-wheels. Those monster truck costumes were quite imaginative! Looks like Lucas had a great party. He looks like one happy 3 yr old. Miles won't stop talking about it. He had the time of his life. 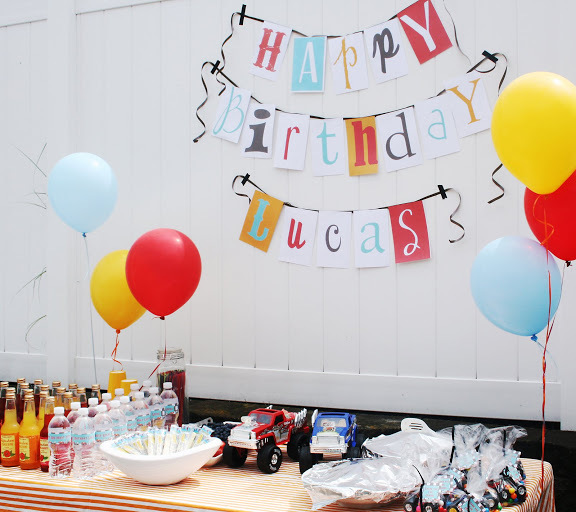 what a fun mommy/party planner you are – lucky Lucas, looks like fun! Very fun party… I love the trucks you made for the kids to race in! Your banner is great too… thanks for all the "how to" tips! Oh, so fun! I love the banner and love the theme. Just look at his face – he had a blast!! The decorations and party ideas you came up with are great! Luke and the other boys were obviously having lots of fun. Adorable! Love the pictures, decorations, and game ideas! Your kids are so lucky to have such a creative mom! So cute. You are such a great mom to throw him this party. you can tell it meant a lot to him. I LOVE how he is all boy and so into trucks. Great job on the banner! The party turned out incredible. I am always amazed on what you can throw together and it turns out perfect. WOW, you are so good, very cute! You are so amazing with your parties!!! You should become a party planner, this looks amazing! Your kids sure are lucky! WOW! You should do this for a living to big mega rich movie stars and make big mega bucks doing it 🙂 Whew!!! How fun! 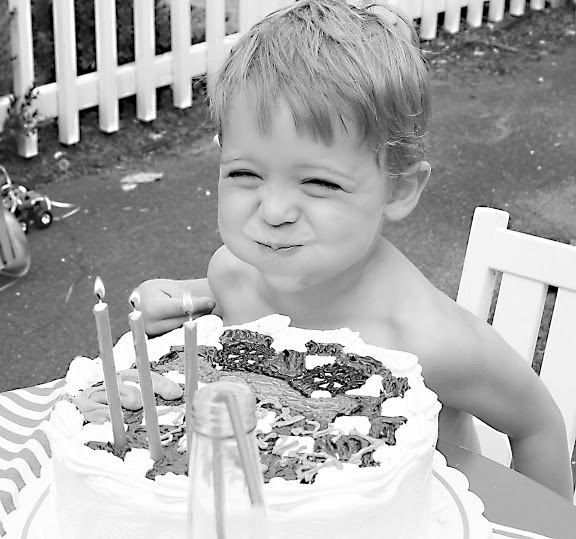 You have become my favorite source for ideas…like homemade baby food and kids birthday parties! You win the best mom ever contest. I'm not going to let Will know about this post. Ever. Then maybe I can pirate all your ideas and win the best mom ever contest too! you really did a great job! so creative. OH MY AMAZING!!! You are so fantastic. 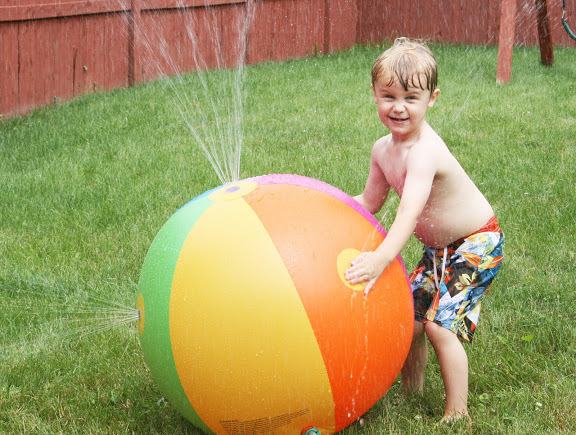 Your kids will have the best memories of all these wonderful things you did for them growing up! What a CUTE Party! I love your banner too….so original. perfect! Wow! I like your party theme and decor. I can imagine how thrilled your little boy must have been. BTW, I shared it on my Facebook page. This has got to be one of the more creative kids' birthday parties I've seen! GREAT job on the portable monster trucks! lucas is destined to be "a pick up man". "u know there's just something women like about a pick up man"
cute banner. Can you share what fonts you used? Looks like a really cute party. I bet he loved it!! Love this idea. I'm putting it on my blog so I can remember it someday. Great idea with the truck boxes!! Wow, what a wonderful party! Amazing job! What a fantastic birthday party! Thanks for the inspiration. Love all the creative ideas you used. Did you use Word to make the banner? Love it! The invites were awesome too. He is one lucky boy! I LOVE the idea of candy in the monster trucks!! I can't find any monster trucks that have open box, would you be able to tell me where you purchased these?? What a cute array of goodies! 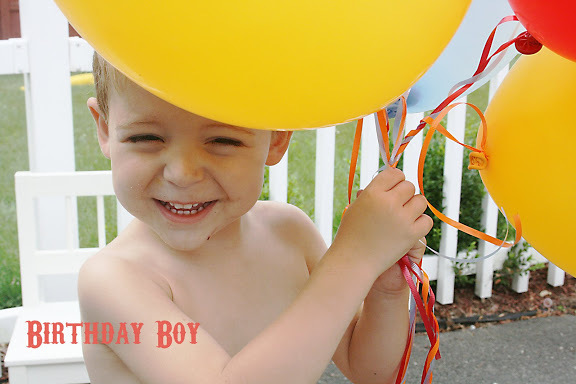 Surely a great party theme for any little boy that loves trucks!